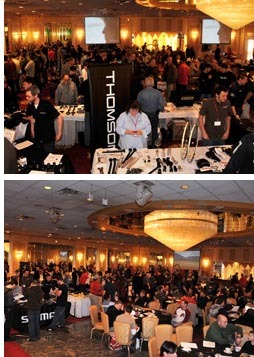 Action Bicycle, the Northeast's largest distributor, will host its 2012 Dealer Expo on Sunday, February 26th. This year's expo will be located at the Crowne Plaza Meadowlands Hotel & Exhibition Center, just a short drive from Action's offices. After the huge success of last year's Expo, a move to a bigger and better location was needed to accommodate the growing list of already 40 attending vendors. "One of our goals has been giving dealers a hands on experience with us and our top vendors. Not every dealer gets to go to Interbike or other trade shows. We really like having our partners in one place for a day of learning new products, winning prizes and receiving generous discounts. It really has turned in to the area's local trade show," says Nick D'Andrea. Last year's event featured many great prizes including a Sram Red Group. This year's list is shaping up to be the best yet.